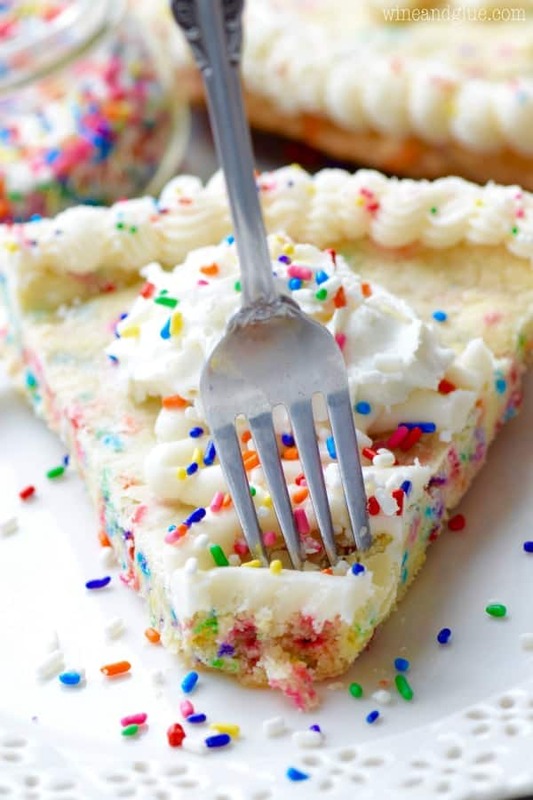 This Funfetti Cookie Cake is the perfect mixture of cake and cookie taste. 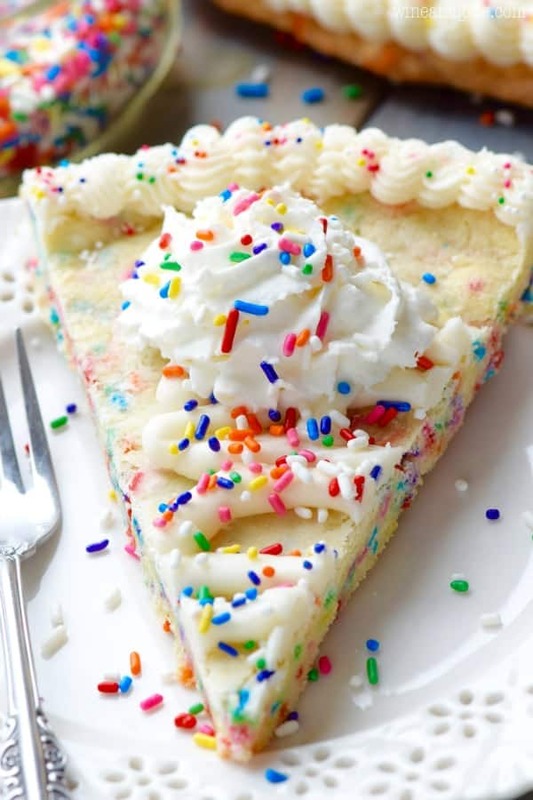 Super easy to make, it’s perfect for your next birthday party! 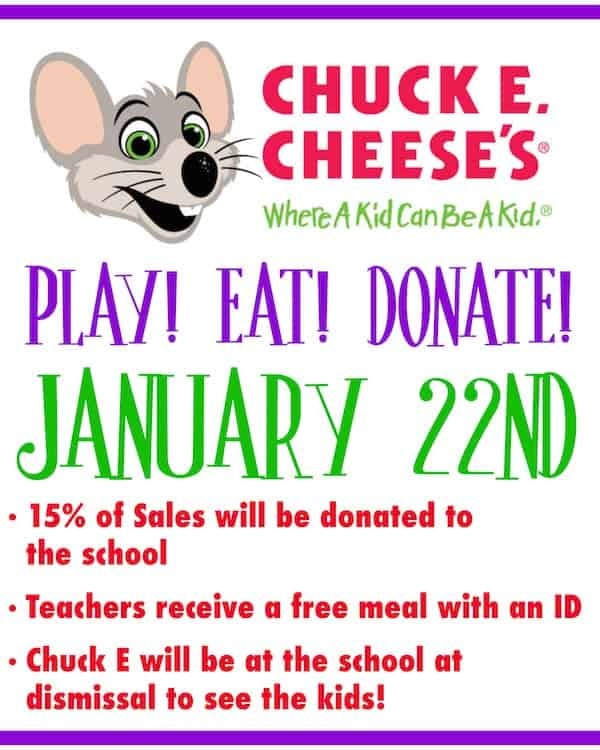 I’m so excited to be partnering with Chuck E Cheese to tell you about hosting Fundraisers and Birthday Parties there! Guys, this is the easiest fundraiser you will ever plan. 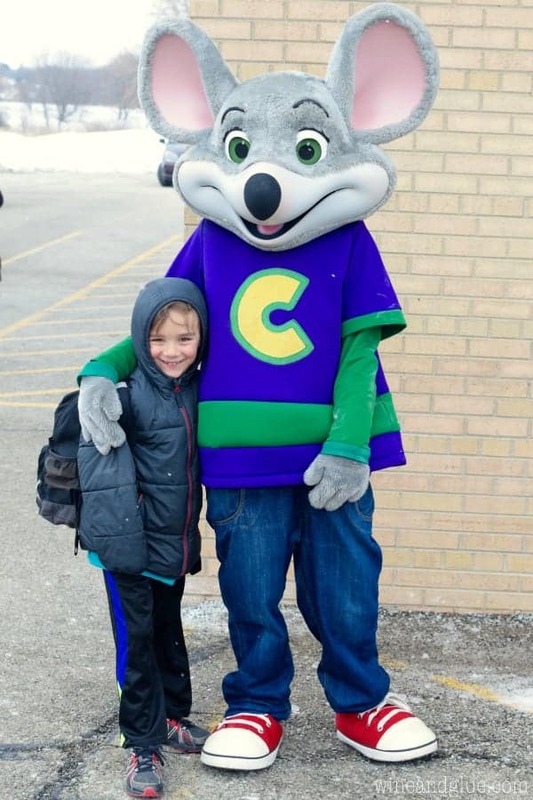 And Chuck E. himself will even come to your school to wave to the kids as they head home the day of the fundraiser! 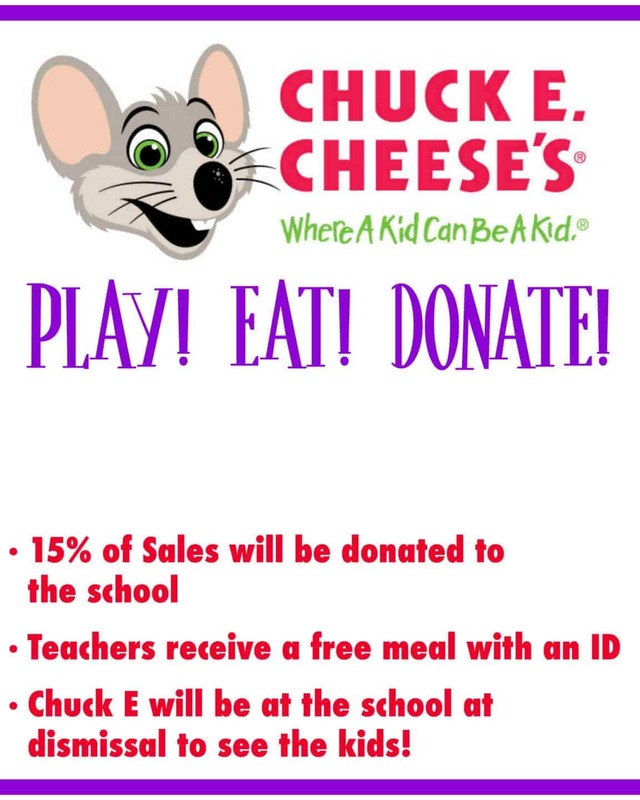 You start by heading to Chuck E Cheese’s homepage, click “Birthdays and events” at the top and then “Fundraisers” right smack in the middle of the page, and then you are taken to a page that walks you through the steps. But really the steps are picking a date at least three weeks out and then you are pretty much set! Chuck E Cheese’s sends you everything you need to make your even successful. 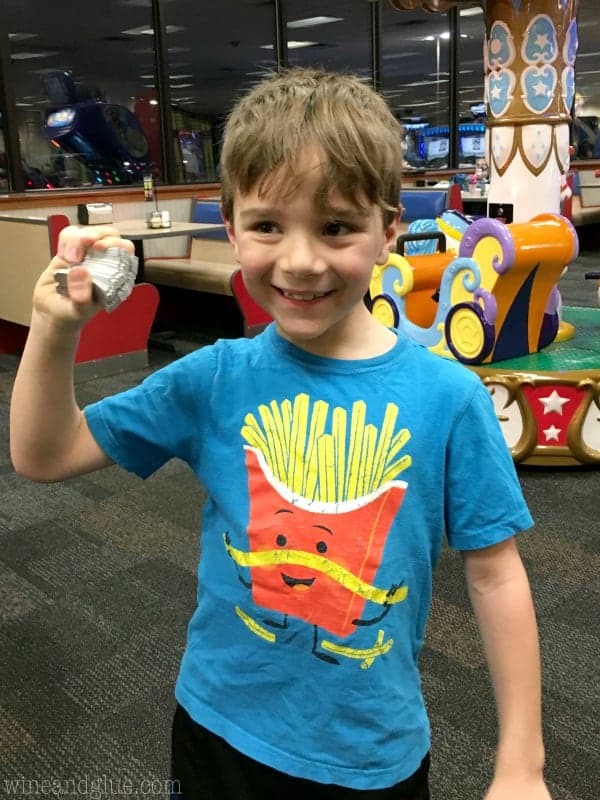 Flyers with coupons to photocopy and send home with the kids, token stickers so each kiddo can get 10 free tokens when they walk in the door, and posters to promote the event at your school! Our school uses an electronic newsletter each week, so if yours does too, you can click HERE to download the flyer I created for our school. The date on yours will be BLANK so just head to PicMonkey, upload the image and add your own text. Then just head there the night of the event and have fun! The cashiers will ask you if you are there with your child’s school and 15% of everything you spend will go right to your school! How awesome, right? 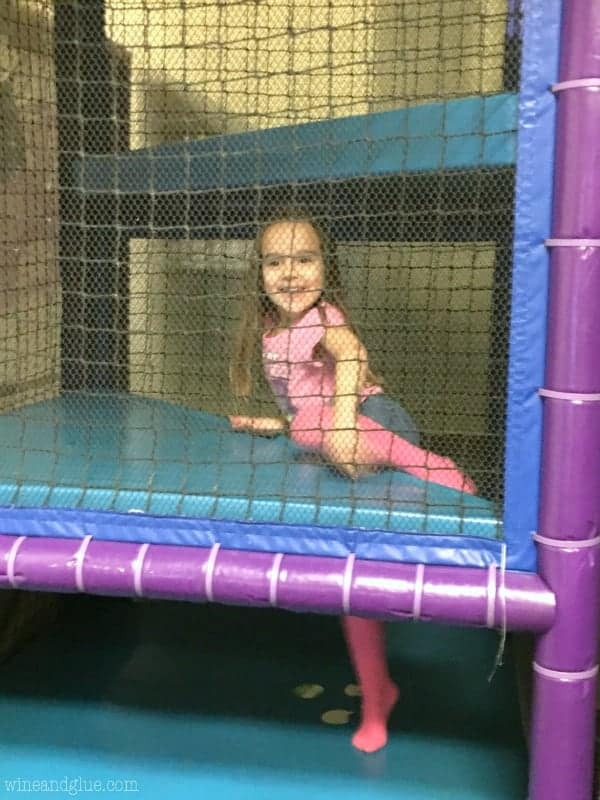 Quinn always makes a bee line to the jungle gym. And Gavin becomes very territorial about tickets. 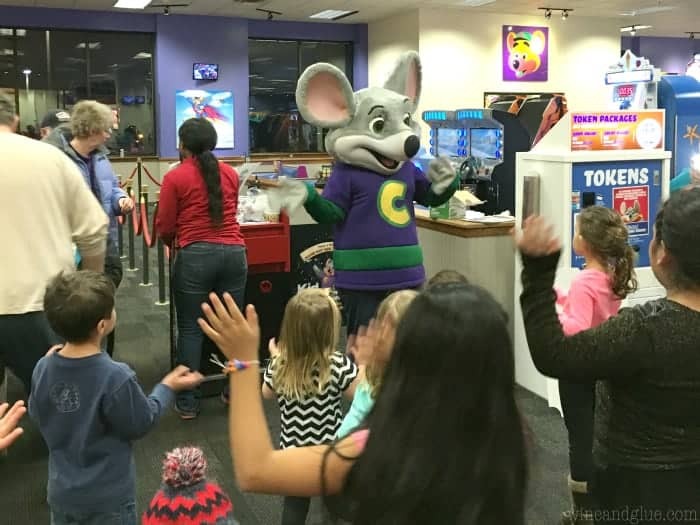 You’ll notice that my kids are no where to be seen when Chuck E. came out to dance with the kids . . . they were way too busy playing. And if you plan a birthday party there, you can bring your own cake! Might I suggest this one? 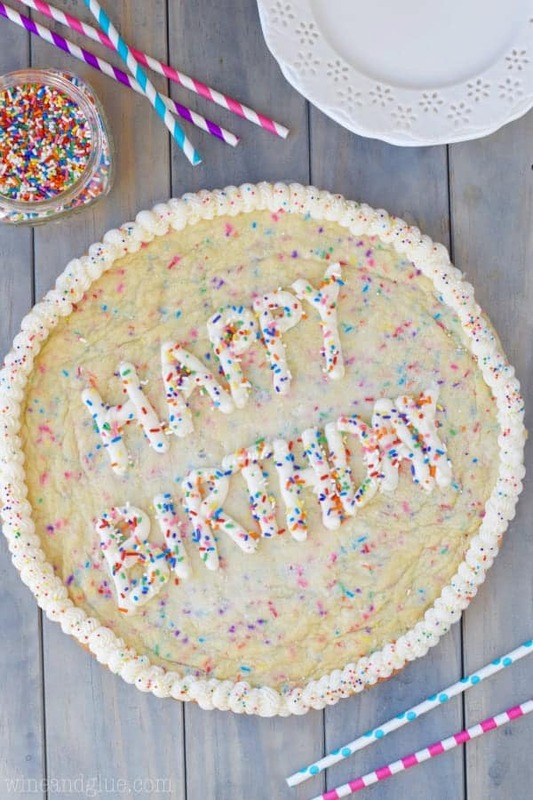 This Funfetti Cookie Cake is crazy easy to make. You whip up some batter, push it into a 12 inch pizza pan (you can buy a disposable one, but I suggest you invest the $5 for the metal one since you are going to want to make it all the time). And then once it has cooled you just decorate it with the world’s best vanilla buttercream frosting. Preheat your oven to 350 degrees. Grease a 12 inch pizza pan with a cold stick of butter, using a paper towel afterwards to even it out. In a large mixing bowl combine the flour, baking powder and salt. Set aside. Mix together the room temperature butter and the sugar. Beat for about three minutes until light and fluffy ensuring that you beat plenty of air into the butter. Add the eggs, one at a time. Then add the vanilla extract and the almond extract. Finally, slowly add the flour mixture, about 3/4 cup at a time, being careful not to over mix it. Gently stir in the sprinkles until well combined. Press the dough into the pizza pan. Bake for 20 to 25 minutes or until the edges of the cookie just begin to to turn golden brown. It is crucial to this recipe that the butter be room temperature. You don't want it melty, and you don't want it too cold. To make it room temperature, leave it cut up on the counter for 30 minutes. Prettiest cookie cake EVER!! I love it. And I need to tell my PTC about that fundraiser – we do them every month at a different restaurant! my daughter calls it Chuck E Jesus ?! I haven’t corrected her yet…. HAHAHAHAHAHA!! That is amazingly awesome Chrissy! I love that this is a fun twist on a birthday cake!! Um, these are flipping gorgeous!! 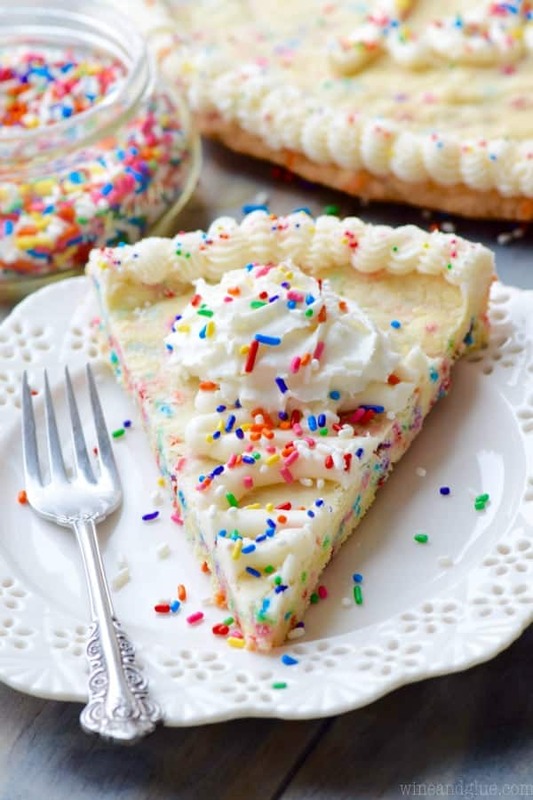 I will take a slice or two! Can I use margarine? We have milk/dairy allergies in the family? Can I make this as a rectangle on a cookie sheet or in a 9×12 pan? Love this for my son who doesn’t like chocolate, loves sugar sprinkle cookies! Hi Marissa! For sure! Just keep an eye on it rather than following my baking time. Enjoy! This is great! Do you know if I can make this in a cast iron? If so, do I need to make any changes? I haven’t tried in cast iron. I’m not sure if I would with this recipe because I feel like the seasoned taste of the skillet wouldn’t blend well with this recipe (but I make a lot of bacon in mine ????). If you go for it, the only change would be cook time. It would probably need to be longer because I suspect it will be thicker. There are 8 TBSPs in a stick, and 3/4 of 8 is 6, and 8 + 6 is 14 🙂 Yup, definitely is 14 TBSPs or 1 3/4 stick! I hope you liked it!